Each year the Graduate School complies a new bulletin. The bulletin is available in PDF format. 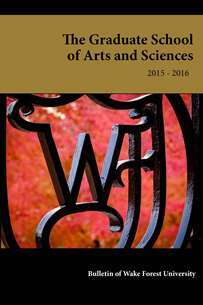 Download the current bulletin from the Graduate School of Art and Sciences website. Our online application process is now 100% paperless. All supplemental documents such as your personal statement, CV, and unofficial transcripts should be attached to the online application. Instructions are provided throughout the application process. Please note that uploaded documents can not exceed 1.5 MB. If your document is larger, please reduce the file size before attaching. Apply Now!